Created to 'connect' Caribbean Librarians; a Clearinghouse which delivers the information you need directly to your desktops; a creative commons to record your thoughts. We all know that the emerging technologies are great to work with, and we all know of the benefits for librarians and patrons alike. But the questions to address are: How do we start using these technologies, how do we keep up with all the changes and where do we find the time to keep up given our busy schedules? •make a personal commitment to learn about the new technologies and stay true to it. •take advantage of the continuing education opportunities, many of them free and available on the web (in my next post I will provide links to these resources). •network with colleagues as they are the ones who are aware of what is available. •my best advice is this - Take the Learning 2.0 Challenge. The Learning 2.0 Challenge is an online self-discovery program that encourages the exploration of Web 2.0 tools and new technologies, specifically 23 Things (such as blogs, wikis, podcasts, Flickr, RSS feeds, Second Life etc.). Many libraries have adopted the program. In fact it is one of the featured talking points at ALA and other conferences. I am currently registered for this program at my library and it has given me the opportunity to create this blog as one of the first exercise. I am endorsing this program. All librarians should try to complete it and library administrators should sanction it. Our university librarian here at ASL has given his endorsement and all staff (professional and paraprofessional are encouraged to take part in the program). There are prizes and other incentives which make participation exciting. If you wish, I can work with you at your library (or connect you with colleagues who can help you) to kick off and complete the program. You can take the challenge individually or as a group. Try Library 2.0 challenge it is the first step to keeping up with the changes in technology!!! Great spirit! Thanks for taking the NSU TLC 2.0 challenge with us. Hello! 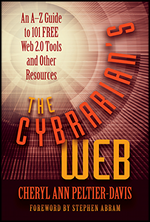 I'm a new librarian in UF's Digital Library Center and Erich sent me the link to your blog. I added it on my blog to my blogroll. It's great that you're interested in Web 2.0 apps--we've got a committee working on them here so hopefully we'll have a lot to share! Other Caribbean Librarians are blogging!